Afternoon tea is a high society tradition offered by our elegant Kalamazoo boutique inn. Our unique boutique inn serves High Tea on Wednesday - Sunday: 11:00 AM until 3:00PM. Our high tea menu is versatile and may change daily based on chef creativity and the market. 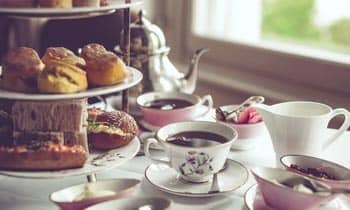 If you are interested in making a reservation for our high tea service parties, you’ll need to call our Kalamazoo party coordinators 24 hours in advance at (269) 344-1827.